All things Performance! Learn more about live lit/storytelling, reading, and solo performance events. Thank you for visiting. This page focuses on shows and events more or less in chronological order. Click the Stories button below to learn more about the work I’ve shared. If you are interested in my participating in your storytelling/performance event, please contact me. Thank you. January 13, 2019 @ The Celtic Knot, Evanston. Join me–just me–as I workshop a new work-in-progress long-form story! December 1, 2018 @ Lincoln Hall, Lincoln Park, Chicago. A return to the Mortified stage to join Robert Kingett in telling his amazing story. November 12, 2018 @ O’Shaughnessy’s, Ravenswood, Chicago. Waxing & Waning: A Literary Journal Issue 02 Release Party! November 27, 2017 @ The Family Wash/Garage Coffee, East Nashville. The Story (Nonfiction): Swim Lessons ~ featured in the issue. A celebration of the new issue of Waxing & Waning from April Gloaming Publishing. August 28, 2017 @ Parnassus Books, Nashville. TenX9 Nashville teams up with The Porch Writers’ Collective for this special edition of the long running live lit show. June 2-3, 2017 @ The Clarence Brown Lab Theatre, University of Tennessee, Knoxville. February 12, 2017 @ Heartland Cafe, Rogers Park, Chicago. September 30, 2016 @ Brisku’s Bistro and Bar, Irving Park, Chicago. September 21, 2016 @ Laugh Out Loud Theater, North Center, Chicago. May 11, 2016 @ The Logan Theatre. Logan Square, Chicago. April 18, 2016 @ The Book Cellar, Lincoln Square, Chicago. April 11, 2016 @ O’Shaughnessy’s, Ravenswood, Chicago. The Theme: Are You There God, It’s Me..? The Story: Silencing the Creaks or The Final Word (2016 revision). July 13, 2015 @ O’Shaughnessy’s, Ravenswood, Chicago. April 16, 2015 @ Ravenswood Used Books, Ravenswood, Chicago. February 14, 2015 @ Mayne Stage, Rogers Park, Chicago. January 27, 2015 @ Uncommon Ground, Lakeview, Chicago. January 24, 2015 @ Lifeline Theatre, Rogers Park, Chicago. December 14, 2014 @ Towbar, Rogers Park, Chicago. November 7, 2014 @ Mary’s Attic, Andersonville, Chicago. October 15, 2014 @ Schubas Tavern (upstairs), Lakeview, Chicago. July 23, 2014 @ Uncommon Ground, Lakeview, Chicago. April 15, 2014 @ The Playground, Lakeview, Chicago. 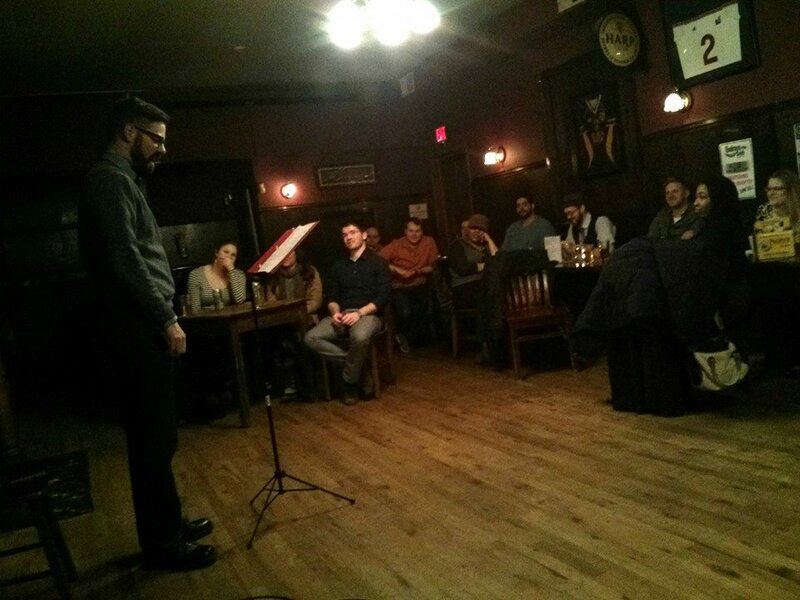 April 14, 2014 @ O’Shaughnessy’s Public House, Ravenswood, Chicago. April 12, 2014 @ The Venue, South Loop, Chicago. February 26, 2014 @ The Black Rock Pub, Chicago. – October 2016 as part of the Chicago Podcast Festival @ Adventure Stage, Chicago. – September 21, 2013 @ Schubas Tavern, Chicago. – December 10, 2011 @ Schubas Tavern, Chicago. – March 2011 @ The Beat Kitchen, Chicago. June 20 & 21, 2011 @ Strawdog Theatre’s Hugen Hall Cabaret, Uptown, Chicago. March 8, 2011 @ The Hopleaf Bar, Andersonville, Chicago. January 19, 2011 @ The Black Rock Pub, Northcenter, Chicago. – November 4, 2010 @ UnCommon Ground, Chicago. – September 2010 @ Uncommon Ground, Chicago. The Story: Is Jimmy Stackpool Singing Too? – June 2010 @ Uncommon Ground, Chicago. June 21-23, 2010 @ Strawdog Theatre’s Hugen Hall Cabaret, Uptown, Chicago. July 9, 2010: Encore Presentation at the Milwaukee Gay Arts Center, Milwaukee, Wisconsin. February 15, 2010 @ The Book Cellar, Lincoln Square, Chicago. June 22-24, 2009 @ Strawdog Theatre’s Hugen Hall Cabaret, Uptown, Chicago. March 5-7 2007 @ Live Bait Theatre, Lakeview, Chicago. June 2006 @ Bailiwick Art Center, Lakeview, Chicago. March 13-14, 2006 @ Bailiwick Art Center, Lakeview, Chicago. February 2006 @ Kate the Great’s Book Emporium, Chicago. June 13 & 15, 2005 @ Bailiwick Art Center, Lakeview, Chicago. February 21-22, 2005 @ Bailiwick Art Center, Lakeview, Chicago. June 20-21, 2004 @ Bailiwick Art Center, Lakeview, Chicago. April 27, 2003 @ Bailiwick Art Center, Lakeview, Chicago. June 2002 @ Bailiwick Art Center, Chicago, Lakeview.